B&A Genetics is so excited to introduce to you one of our summer sales interns, Shailin Heckard. 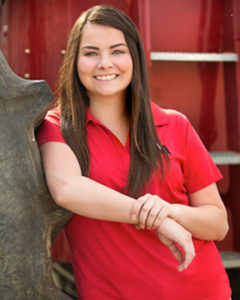 Shailin grew up in Logansport, Indiana, where her family runs a corn and soybean operation, along with livestock. Shailin is actually graduating from Purdue University a year early where she is studying agricultural communications. Agriculture was nothing new to this 10 year 4H member. Being involved with the industry for most of her life is what took her passion to further her knowledge and skills in agriculture. If she has some down time Shailin likes to spend time with her friends on the Purdue Livestock Judging team. When she is not with them she likes to be with her friends and family on their family farm or walking her dog, Tito.